Home > Introduction to Wine > What is Viticulture? Vitictulure is the scientific study of the growing of grapes. A viticulturalist aims to enhance quality of grapes by careful and sustained manipulation of the conditions in which a vine grows. Where the growth of these grapes then leads to the production of wine this process is sometimes referred to as viniculture. Viticulture is thought to be as old as the domestic cultivation of grapes itself and has always revolved around the widely varying results a grower can obtain by even minor changes in soil, weather and planting conditions. 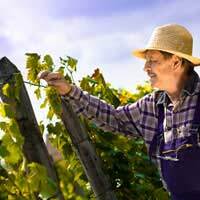 Closely associated with viticulture is ‘enology’, the study of all aspects surrounding the production of wine from the growth of the wine, to its bottling, storage and consumption. The term viticulture is often applied to the logistics of home growing wine, although in reality the process undergone with self made wine is rarely ever comparable to the rigorous scientific deployment of viticultural techniques on a commercial scale. The earliest recordings of viticulture hail from ancient Rome, where it was first noted that steep hillsides are ideal for the growth of vines, as it allows for sun to reach the maximum amount of vines throughout the day. From Rome, viticulture was exported with the Roman Empire throughout Europe to existing vine growing countries. During the Middle Ages viticulture was largely developed, and brilliantly so, by monks, such as the French Cistercians. Vines were kept by the monks and tended ‘religiously’: their dedication to the grape was devout. At this time the importance of terroir was noted, and vineyards were developed so as to provide consistent quality wines all throughout the year. From here, viticulture helped to overcome the phyloxerra epidemic by developing hybrid plants that were resistant to the vine disease and, further, by grafting young vines on to the rootstock of disease and pest resistant vine varieties. Such advances have led to a continued period of stability in wine crops worldwide, allowing for further experimentation and advances in consistency. In the 20th Century viticultural techniques were turned more than ever towards financial gain. The result is the production of stable wines of a middling quality on a huge scale, often produced for export. Whilst this arguably has contributed to a drop in quality at one end of the market, advanced viticultural techniques have proved useful at the other end of the market, where, for example temperamental grapes such as Pinot Noir have come into their own following the discovery of ideal soil conditions in the New World. There is always ongoing debate as to whether new technologies risk ruining good wine. It is beyond doubt that advances in viticulture will have changed wine dramatically, yet it must be noted that wine has been ever evolving. It must also be noted that the unpredictability of many crops for most of wines history has never been a benefit. All the talk about ‘great vintages’ often serves as a cover for the fact that many vintages were really not that good at all! Stabilisation of wine production through scientific advance serves to address this, whilst leading to less waste, and possible improvement of even the best wines. On the other hand, it may be countered that a great many old techniques produce excellent wines, and these techniques must continue to be protected.